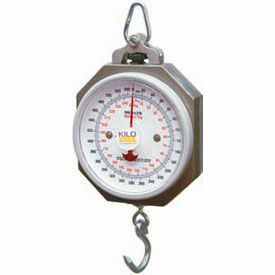 Industrial Hanging Scales are Perfect for Weighing Food. These hanging scales feature high industrial quality thats great for butchers, fish markets, and dairy and produce shops. 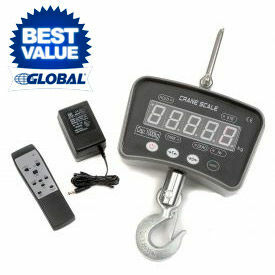 These hanging weight scales have a durable, scratch resistant cast aluminum body and a shatter resistant face plate. Heavy duty welded steel mounting shackle ring and pointed large J-hook. The single sided 7-1/2 dial kg. and lb. dial of these hanging weighing scales are easy to read. 1 Year Limited Warranty. 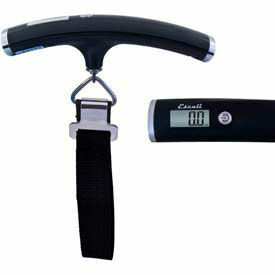 Digital Luggage Scales Used For Personal And Business Travel. Digital Luggage Scales help prevent overweight bag fees when traveling. Easy to use and compact in size for traveling convenience.